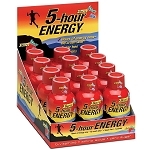 Five Hour Energy manufactures a great line of energy drinks. 5 hour energy drinks are made with a mixture of vitamins, caffeine, and different energy blends. Five Hour Energy drinks have no sugar, about as much caffeine as a cup of coffee, and only about 4 calories per serving.